Here’s what we brought back from California: a huge jug of olive oil, grown and pressed a few miles from where I grew up. Bags and bags of almonds and walnuts from the nut orchards we drove through to get to my parents’ house. And a 20 lb. box of peaches, nectarines, and plums, so that we can go on pretending that it’s summer even though it appears to have skipped straight from spring to fall in Seattle. 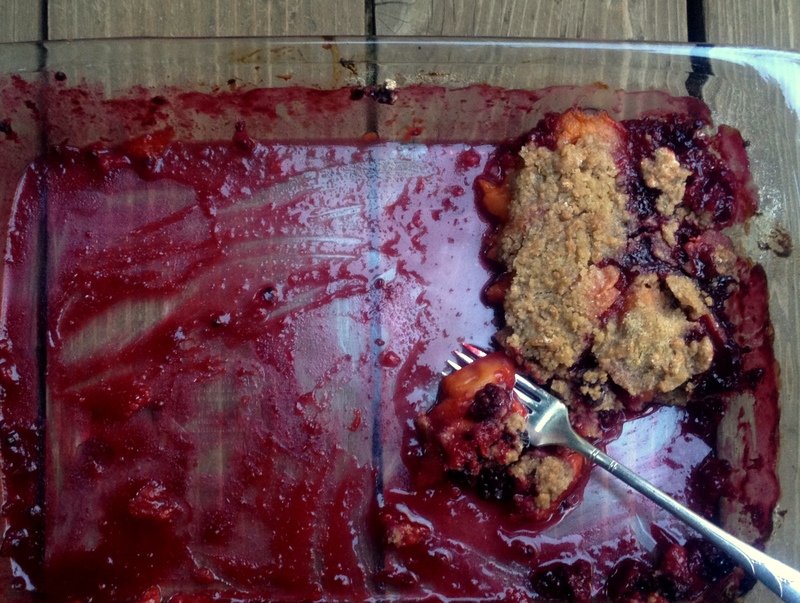 Mostly we eat ripe fruit alone, which is really its highest and best use, but last week this cobbler recipe appeared on Dinner: A Love Story and it sounded so simple and good that it was in the oven almost before I knew it. Luckily we had lots of people hanging around that day, and it was gone within hours. Apricot and Blackberry Cobbler: Mix about 4 c. sliced apricots with 2 c. blackberries and a squeeze of lemon juice (I was lucky enough to have a Meyer lemon). Spread fruit evenly in a 9×13 pan. In a medium bowl, combine 1 c. flour (I used half whole wheat flour), 1 c. sugar, 1 tsp. salt and 1 tsp. cinnamon and stir well. Add a beaten egg and toss well again to make crumbs. Spread crumbs over fruit mixture and carefully pour about 6 Tb. melted butter all over (if you miss spots they will be dry). Bake at 375 for 35-40 minutes. This entry was posted in Baking, Desserts, Food, Fruit, Recipes and tagged apricots, blackberries, summer dessert, summer fruit on July 1, 2012 by emmycooks. Mmm, apricots and blackberries is a new combination to me – sounds good! I’ve never put those two together, but it sounds divine. A 20 box of fresh, summer fruits? I’m so jealous! Is this the same as a crumble? I am dying for it to be peach season in Seattle…is it ever? In the meantime, your strategy of importing from CA is very wise! Oh my yum! I love the photo here — it really shows how delicious this was — and, being a homegrown NorCal girl myself, I am so curious about where those orchards were! Anyway, thanks for sharing! I love your photo! Shows how yummy your almost gone dessert was! And California olive oil is the best. Europeans will stone me for this comment, but it’s true!